The first one is a 2002 Spirit R Type B version that will be added to the 'The Model Car' series ("Mazda FD3S RX-7 Spirit R Type B '02", 'The Model Car' series Nr.77, cat nr.055861, price 2600 yen). The kit is scheduled for release in late June (Aoshima 'FC3S Savanna RX-7 Winning Limited' Best Car GT 70, cat nr.004227, price 2400 yen). Aoshima has announced a rerelease of the RE Amemiya FD3S RX-7 kit, scheduled for release in May (Aoshima 'RE Amemiya FD3S RX-7' S Package Ver.R 96, cat nr.047965, price 2200 yen). Aoshima has announced a rerelease of the FD3S RX-7 Vertex kit, it looks like the kit once again will include wheels that differ from the box art pictures, this time the prototype kit was fitted with 19in Volks RE30 wheels instead of the Yokohama AVS Model5 wheels on the pictures of the actual car. The picture on the right is an official Aoshima announcement picture, it looks like the color change from lime green to red was done on the computer (compare original image here). The kit is scheduled for release in late December ('Vertex FD3S RX-7', S-Package Ver.R series nr.83, cat nr. 3001639, price 2400 yen). Many Tamiya 80s Masterpiece Models rereleases, including the RX-7 FC and RX-7 FC Cabriolet appear to be available worldwide. The rereleased Tamiya RX-7 FC and RX-7 FC Cabriolet are available now. If you're looking for a shop that stocks these kits, check out Rainbow 10. A rerelease of the Savanna RX-7 Cabrio is scheduled for July. Remember, only these Tamiya FC kits contain accurate chassis details. On top of that both kits include a fully detailed 13B engine. Google translation of overview of Tamiya Japan limited releases. Aoshima has a rerelease of the FC3S RX-7 Late Type '89 scheduled for August. I noticed HLJ lists the Minicraft Rotary Engine kit as a new release, well maybe for Japan it is but AFAIK this kit has been available for quite some time elsewhere. I almost missed this one: a limited release Itasha version of the Aoshima RX-7 (FD3S) Mazdaspeed GT-Concept. It is available now ('FD3S RX-7 Mazdaspeed GT-C "Working!! "', Itasha series nr.SP, cat nr. 050361, price 3800 yen). The Aoshima reboxed 1991 Enfini RX-7 FD3S kit is available now ('FD3S RX-7 1991', Best Car GT series nr.36, cat nr. 050286, price 2000 yen). Aoshima has a reboxing announced of the kit that started their long line of FD kits: the 1991 Enfini RX-7 FD3S kit ('FD3S RX-7 1991', Best Car GT series nr.36, cat nr. 050286, price 2000 yen) release is scheduled for October. 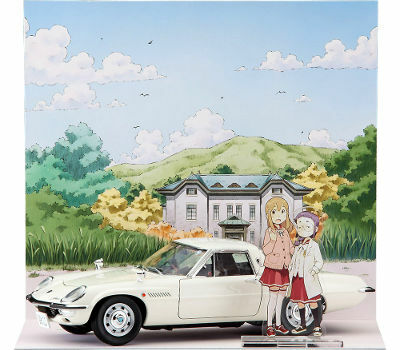 The Fujimi RX-7 SA22C 'Kämpfer' Itasha kit (Fujimi 'Kämpfer RX-7 SA22C', Chara-de-Car Series 20, cat nr.189635, price 3800 yen) and the rerelease of the old 18in Low Profile series RX-7 FC kit with 18in ZEIT wheels (Fujimi 'Mazda Savanna RX-7 (FC3S)' Inch Up Disc series ID-158, cat nr.038377, price 2200 yen) are available now. 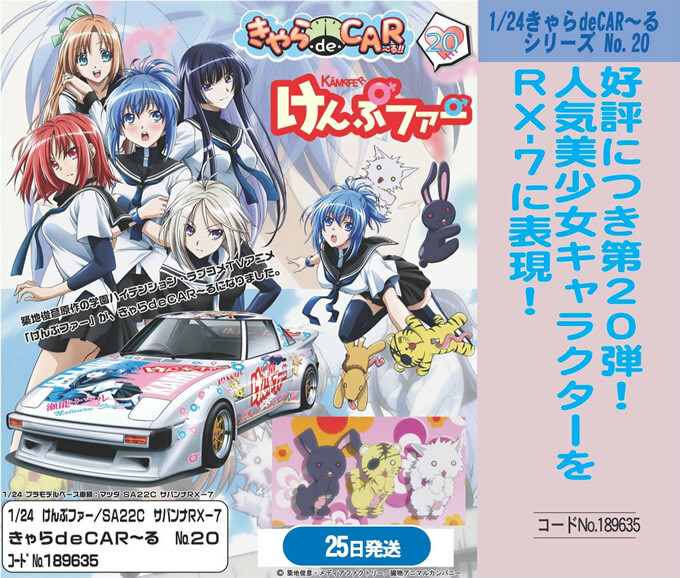 Fujimi has announced an Itasha version of their RX-7 SA22C street racer kit (Fujimi 'Kampfer RX-7 SA22C', Chara-de-Car Series 20, cat nr.189635, price 3800 yen) and a rerelease that looks like a rebox of the old 18in Low Profile series RX-7 FC kit, the text mentions 18in ZEIT wheels although the picture shows OZ wheels (Fujimi 'Mazda Savanna RX-7 (FC3S)' Inch Up Disc series ID-158, cat nr.038377, price 2200 yen) , both releases are scheduled for late June. The rereleases of the Fujimi RE Amemiya Greddy 9 FD3S RX-7 (Fujimi, Inch Up Disc Series ID-153, cat nr.038315, price 2800 yen) and the RX-7 FD3S Mazdaspeed B-Spec (Fujimi, Inch Up Disc Series ID-154, cat nr.038322, price 2800 yen) are available now. 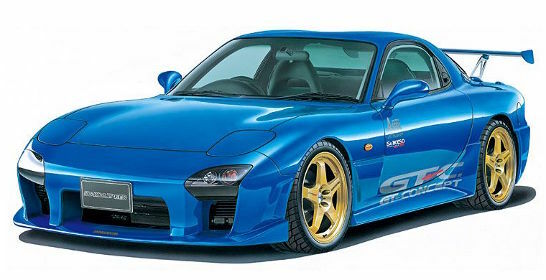 Fujimi has announced two more rereleases of former Racing Star Series RX-7 FD kits, the RE Amemiya Greddy 9 FD3S RX-7 (Fujimi, Inch Up Disc Series ID-153, cat nr.038315, price 2800 yen) and the RX-7 FD3S Mazdaspeed B-Spec (Fujimi, Inch Up Disc Series ID-154, cat nr.038322, price 2800 yen), both rereleases are scheduled for late May. The Aoshima Loveplus Itasha RX-7 FD (Aoshima 'Loveplus FD3S RX-7', Itasha series nr.14, cat nr.049129, price 3600 yen) is available now. Aoshima has another RX-7 FD lined up for the Itasha series, this time a white 1998 FD3S with 'Loveplus' graphics. The large decal sheet will offer a choice of three versions for each of the main Loveplus characters. The release is scheduled for late april. 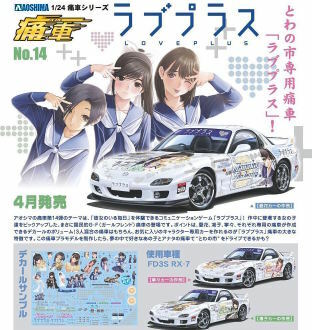 (Aoshima 'Loveplus FD3S RX-7', Itasha series nr.14, cat nr.049129, price 3600 yen). 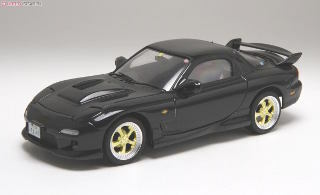 Aoshima has announced a rerelease of the black prepainted stock '98 RX-7 FD, it is scheduled for release in early march (Aoshima 'Mazda RX-7 FD3S 1998 Brilliant Black', Pre Painted Model series Nr.8, cat nr.040041, price 2900 yen). The rerelease of the stock '98 RX-7 FD (Aoshima 'Mazda RX-7 FD3S 1998', Best Car GT series Nr.58, cat nr.048955, price 2000 yen) and the RE Amemiya RX-7 FC with 'Air' Itasha graphics (Aoshima 'AIR FC3S RX-7 late type RE Amemiya specs', Itasha series nr.13, cat nr.048849, price 3600 yen) are available now. 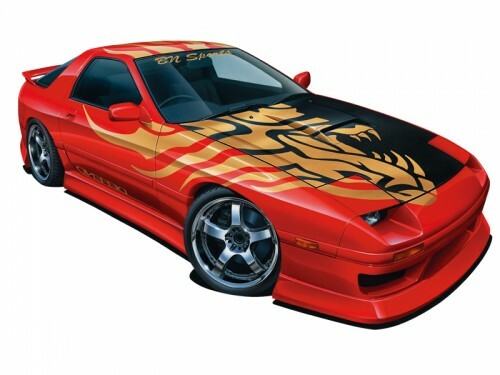 the second one is an RE Amemiya RX-7 FC with 'Air' Itasha graphics, this kit will contain a hood without the intercooler scoop (Aoshima 'AIR FC3S RX-7 late type RE Amemiya specs', Itasha series nr.13, cat nr.048849, price 3600 yen). The rerelease of the Fujimi RE Amemiya µ RX-8 ENKEI by Greddy is available now (Fujimi 'RE Amemiya µ RX-8 ENKEI by Greddy', Inch Up series nr.149, cat nr.038209, price 2600 yen). Fujimi is about to rerelease another kit from its former Racing Star series into the Inch Up Disc series, this time the RE Amemiya µ RX-8 ENKEI by Greddy, it is scheduled for early february (Fujimi 'RE Amemiya µ RX-8 ENKEI by Greddy', Inch Up series nr.149, cat nr.038209, price 2600 yen). This one caught me by surprise as it was not on the new release announcements on the Aoshima site, but it is available now. 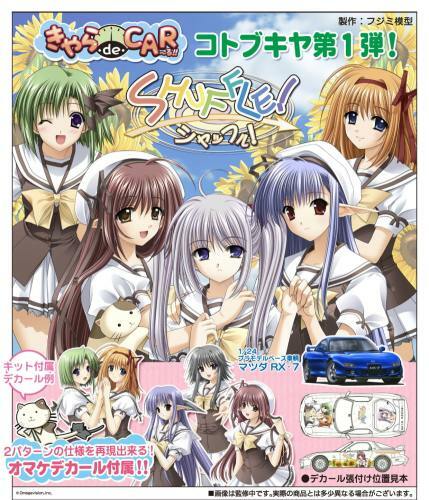 The kit is the same as the RE Amemiya FD street version with a large high quality decal sheet with Itasha graphics (Magical Girl Lyrical Nanoha StrikerS Fate T Harlaown) added. 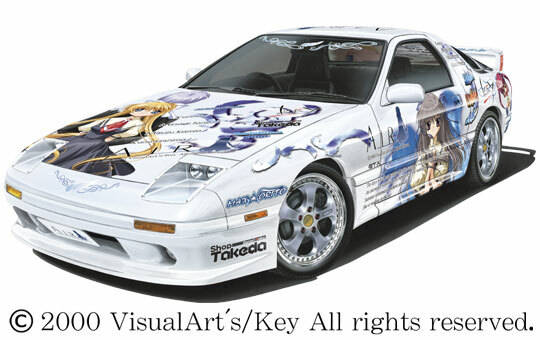 (Aoshima 'Nanoha StrikerS Fate Mazda FD3S RX-7 RE Amemiya ft Art Factory', Itasha series nr.12, cat.nr.048276, price 3600 yen). The limited edition Fujimi Mazda Savanna GT Racing kit (Fujimi Mazda Savanna GT Late Model Racing Type, Spot release IDSP-75, cat.nr.038117, price 3000 yen) is available now. Fujimi has announced another racing version of the Rx-3 Savanna, it looks like a limited edition decal variant of the racing version of the RX-3 Savanna kit that was released before (i.e. a street racer, with all of the exterior features of the actual race cars, but with a stock interior and exhaust). The kit is scheduled for release in late August (Fujimi Mazda Savanna GT Late Model Racing Type, Spot release IDSP-75, cat.nr.038117, price 3000 yen). The RX-7 FD3S Shuffle ! (Kotobukiya Chara-deCar series nr. K01, cat. nr. KI001, price 3800 yen) is available now. 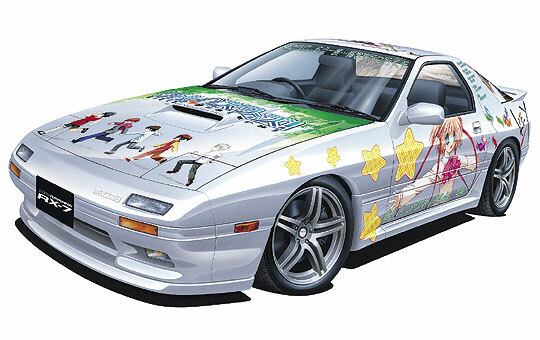 The RX-7 FD Itasha Alicia Infans (Chara-deCar series nr. 3, cat. nr. 189420, price 3800 yen) is available now, as are the rereleases of the VeilSide RX-8 Ver.1 Model (SE3P) (Inch Up Disc Series Nr.138, cat.nr.038056, price 2800 yen) and the RE Amemiya µ Boost Up 7 SPL (Inch Up Disc Series Nr.141, cat.nr.038087, price 2600 yen). 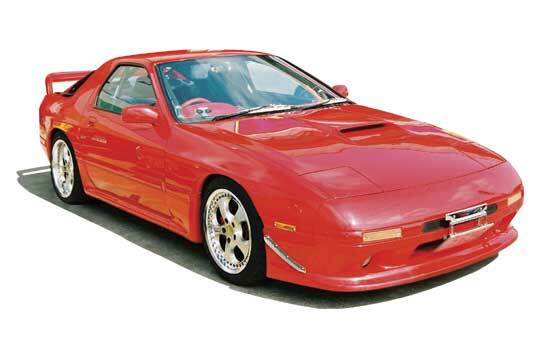 Another Fujimi/Kotobukiya Itasha RX-7 FD model kit is scheduled for release in June ( Mazda RX-7 FD3S 'Shuffle! ', Chara-deCar series Nr.K01, cat.nr.KI001, price 3800 yen). Fujimi has announced rereleases of the RE Amemiya µ Boost Up 7 SPL (Inch Up Disc Series Nr.141, cat.nr.038087, price 2600 yen) and the VeilSide RX-8 Ver.1 Model (SE3P) (Inch Up Disc Series Nr.138, cat.nr.038056, price 2800 yen), both kits have now been moved into the Inch Up Disc Series and are both scheduled for release in early May. Let's hope Fujimi will include the improved handed VeilSide 18in Andrew Baccarat wheels in the RX-8 kit this time. 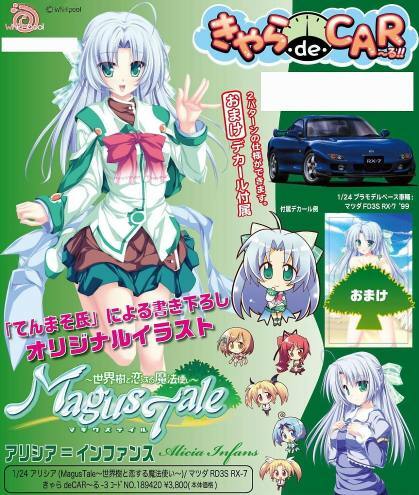 Fujimi is about to give another RX the Itasha treatment, this time a '99 RX-7 FD3S will get Alicia Infans (Magus Tale) graphics. The kit is scheduled for release in late April (Chara-deCar series nr. 3, cat. nr. 189420, price 3800 yen). If you blinked, you've missed it: this RX-8 release sold out very fast. It is a nice kit: Fujimi used the corrected RX-8 body and the decal sheet is as large as the box lid ! 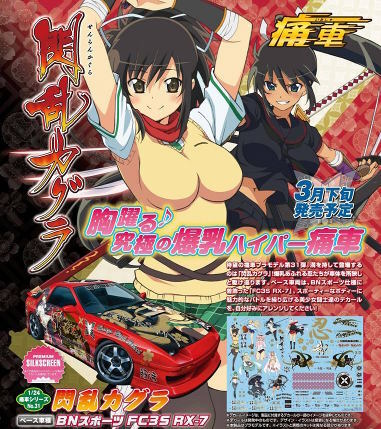 (Fujimi Chara-deCar series nr. 1, cat. nr. 189413, price 3800 yen). Aoshima released its second RE-Amemiya FC3S this time a full specs REsuperG version. (Aoshima S-Package Ver.R series nr. 49, cat. nr. 042540, price 2600 yen). Aoshima also did a rerelease of their popular RX-7 FC3S '89 (Aoshima Best Car GT series nr.71, cat. nr. 046609, price 2200 yen). Studio27 decal set nr DC761C depicts the flat-black painted SpeedSource Castrol Syntec Mazda RX-8 nr.70 that won the GT class (9th overall) at the 2008 24h Daytona race (Studio27, cat. nr. ST27-DC761C, price 2000 yen). Aoshima released the first of a pair of RE-Amemiya versions of the FC3S (Aoshima S-Package Ver.R series nr. 50, cat. nr. 042533, price 2200 yen). Aoshima gave its second RX-7 kit the Itasha treatment, this time an FC3S. (Aoshima Itasha series nr. 04, cat. nr. 044179, price 3600 yen). Studio27 decal set nr DC760C depicts the white painted SpeedSource FXDD Mazda RX-8 nr.69 that finished 5th in the GT class (16th overall) at the 2008 24h Daytona race, it is the stablemate of the GT Class winning RX-8 (Studio27, cat. nr. ST27-DC760C, price 2000 yen). Aoshima released another interesting variant of its RX-7 FC Turbo II kit, this time the lightweight Infinity 3 model (Aoshima Best Car GT series nr. 35, cat. nr. 042526, price 2200 yen). Fujimi released its kit of the Hydrogen powered RX-8 again, this time using the corrected body (Fujimi Inch Up Disc series nr. IDSPOT 64, cat. nr. 03778, price 2600 yen). Here's another chance to get two sought-after kits: Hasegawa did another run of the Cosmo MAT vehicle (Hasegawa CQ series, cat. nr. CQ-1, price 2200 yen) and finally have done a rerelease of the 767B Finish Line kit (Hasegawa CC series, cat. nr. CC-20, price 2000 yen). Both kits are unchanged apart from minor changes on the side of the box (price, bar code, copyright date). Fujimi has released the racing version of the RX-3 Savanna it turns out to be a street racer, with all of the exterior features of the actual race cars, but with a stock interior and exhaust. 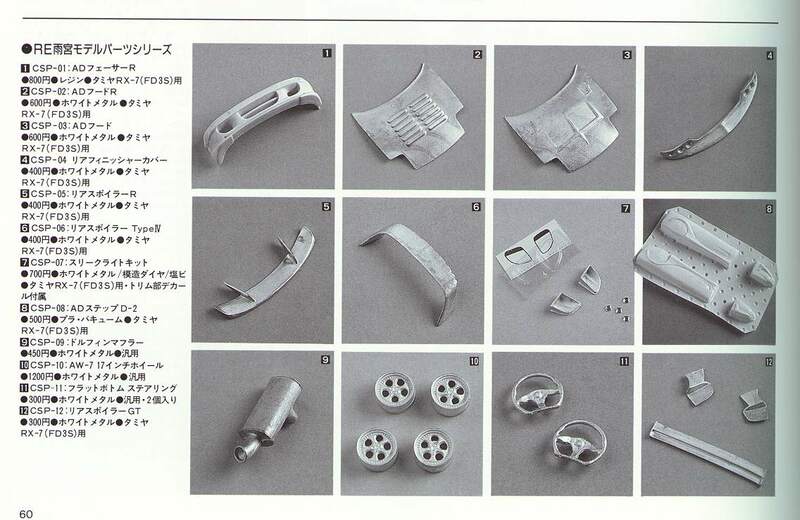 Fujimi revised its catalog, this kit received the same catalog number as the now deleted Savanna GT Late Model. (Fujimi Inch Up Disc series nr. 109, cat. nr. 037691, price 2800 yen). 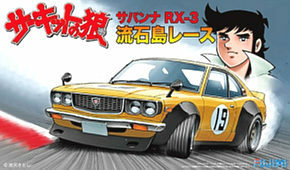 Fujimi plans to release a racing version of the RX-3 Savanna, it is scheduled for the end of May (Inch Up Disc series nr. 109, cat. nr. 037691, price 2800 yen). 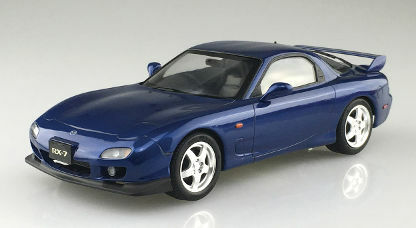 Aoshima plans to release another RX-7 FC kit, this time as an Infinity 3 version. The Infinity versions were factory developed lightweight versions of the FC Turbo II. The kit is scheduled for release in July (Best Car GT series nr. 35, cat. nr. 042526, price 2200 yen). Fujimi released a limited run of its RX-8 in Japanese Highway Patrol livery, the kit includes updated decals (Highway Patrol series HP-SP, cat. nr. 189406, price 2600 yen). 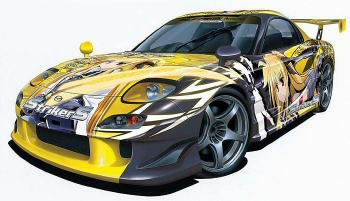 Aoshima did another variant of their RX-7 FD '98 kit, this time in the new Itasha Series, covering cars adorned with anime graphics (these are depicting actual cars, not just anime merchandise) FD3S RX-7 Haruhi Ism. Apart from a huge decal sheet there are some nice new WedsSport SA-70 wheels included (Aoshima Itasha series nr. 1, cat. nr. 041406, price 3200 yen). Aoshima has made a new run of their popular Mazdaspeed RX-7 FD GT-C kit. Apart from the box art and the colors of some of the parts it is identical to the earlier release (Aoshima S-Package Ver.R series nr. 60, cat. nr. 042175, price 2000 yen). Aoshima released a pair of RX-7 FD '98 kits with factory painted bodies and interior bits back in July, but it looks like both kits are still available. The black version (Prepainted Model Series Nr.8, cat. nr. 04004, price 2900 yen) is great, but unfortunately the paint on the blue version (Prepainted Model Series Nr.7, cat. nr. 04003, price 2900 yen) is the wrong shade for Innocent Blue Mica. The new Aoshima RX-7 FC 'Initial D' kit is available now (Initial D series Nr.3, cat. nr. 039526, price 2200 yen). The regular release of the Fujimi RX-7 FD Spirit R Type A kit and the Mazda Savanna (RX-3) GS-II in the new Fujimi Lamé Machine series (yep, that's 'Lamé' as in 'gold' not 'Lame' as in 'naf' !) are available now. Just when you thought RX-7 models were slipping into oblivion, Fujimi announces some rereleases. First one is the RX-7 FD3S Spirit R Type A kit which will be released as a regular item (not a limited release) in the first week of March (Inch Up Disc Series nr.89, cat. nr. 03726, price 2200 yen). Second is another limited run of the RX-7 FC3S with resin 13B engine display which will be released in March (Inch Up Disc series ID-SPOT, cat. nr. 03683, price 2800 yen). Finally another release of the Mazda Savanna GS-II (Rx-3), this time in a new series called 'Lame Machines' (I sure hope that's a translation error ), scheduled for the second week of March (Lame Machine series Nr.1, cat. nr. 18919, price 2600 yen). 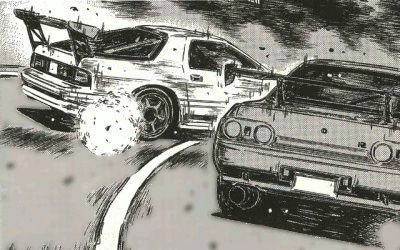 In March Aoshima plans to release another RX-7 FC kit, this time an Initial D series version (Initial D series Nr.3, cat. nr. 039526, price 2200 yen). As usual I borrowed the pictures from the Fujimi and Aoshima websites. I almost missed this one: Aoshima released a street version of the Aoshima D1GP RE Amemiya Super G drift racer. The Aoshima kit of the record breaking Racing Beat RX-7 FC is available now. It contains a nice and accurate decal sheet, a lefthand drive dashboard, solid wheels with molded on narrow tires and the instruction sheet contains some b/w detail pics of the real car and some info in japanese. It is a limited issue, so if you want one, get it now. In the meantime the pair of Aoshima D1GP RE Amemiya Super G drift racers has been released as well and these kits were well worth the wait ! The Fujimi kits for the Amemiya RX-7 FD RE Super G and the limited edition FC with engine and the Aoshima BN Sports RX-7 FC are available now. Hottest news is the announcement of a limited edition kit of the Racing Beat RX-7 FC that broke the land speed record in its class in 1986 at Bonneville (Class C Grand Touring, 238.44 mph; 382 km/h). The kit is scheduled for release in september (cat.nr.03768, price 2000yen). The release of the pair of Aoshima RE Amemiya Greddy D1GP Drift racer kits has slipped a bit, both should become available this month. As usual I borrowed the pictures from the Aoshima website. Shizuoka Hobby Show: more Fujimi and Aoshima RX-7 FD and FC kits coming up ! At the recent Shizuoka Hobby Show a lot of new RX-7 models were announced, check this site for a pictorial report of the show. Fujimi will do a street version of the wide bodied RX-7 FD RE Super G kit that was released last month in the Initial D series (RE Amemiya µ Boost Up 7 SPL, Racing Star series Nr.26, cat.nr.18908, price 2200yen). 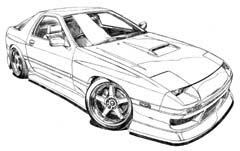 In July Fujimi plans to release a limited edition of the regular Inch Up RX-7 FC kit, but this time parts for a complete 13B engine will be included (Mazda FC3S Savanna with Engine, cat.nr.03683, price 2800yen) it looks like the hood is still molded in with the body so the engine is meant for displaying outside of the car. Aoshima has announced a pair of RE Amemiya Super G FDs in their D1 GP Drift race series, scheduled for July release one is a special limited issue (RE Amemiya GReddy D1 7(FD3S) 2004, cat.nr.03794, price 2200yen) the other one a regular rlease (RE Amemiya GReddy D1 7(FD3S) 2005,D1 GP series nr.13, cat.nr.03793, price 2200yen). In July Aoshima also plans to release another street version of the RX-7 FC, this kit will have the same body kit as the D1 GP Team Samurai Project car released last april (BN Sports RX-7 FC3S, S-Package Ver.R series, cat.nr.03801, price 2000yen). 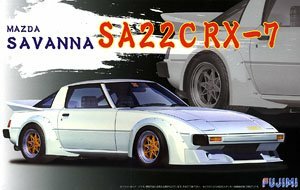 The Fujimi Savanna (RX-3) GT Late with Upgrade Parts is available now, as is a kit I almost missed out on, the Fujimi Initial D live action movie version of their good old RX-7 FC kit. For April, Aoshima has a pair of hot D1 GP Drift race RX-7 FC's scheduled, the first one is from the 2006 season and is a regular issue (Team Samurai Project, D1 GP series nr.11, cat.nr.03704, price 2200 yen), the other one is for the same car in last years color scheme and is a limited release (Team HPI, cat.nr.03705, price 2200 yen). Fujimi has some new Initial D releases scheduled for this month, including the latest version of the RX-7 FD of Keisuke Takahashi, the box art shows the FD being upgraded to a full specs Amemiya RE Super G street version, similar to the kit Fujimi announced over 5 years ago (see the bottom of this page) but which was never actually released (FD3S RX-7 Project D Version, Initial D series, cat.nr.18359, price 2200 yen). The Fujimi Savanna (RX-3) GS-II with racing decals is available now. For January, Fujimi has a limited release planned of the Savanna (RX-3) GT Late version with upgrade parts (Inch Up series, cat.nr.03663, price 2800 yen). The Aoshima RX-7 FD3S Drift Machine, RX-7 FC3S '85 and RX-7 FC3S '89 are available now, also available now are two rereleases of older 1/20 Aoshima Rx-7 SA racer kits, one as a customized street car (cat nr. 03706, price 2900 yen) and one in race livery (cat nr. 03708, price 2900 yen). Fujimi has another Savanna RX-3 kit scheduled for release in late november, a GS-II with racing decals (Nostalgic Heroes Series, cat.nr. 04323, price 2500 yen). 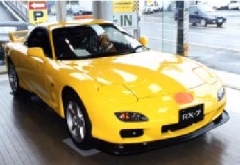 an RX-7 FC3S Late Model (Best Car GT series, cat.nr.03676, price 1800 yen). The Aoshima RX-7 FD '98, Fujimi RX-8 USA Custom and Savanna GS-II are available now, also available are some fine Savanna (Rx-3) photo-etched detail sets by Acu-Stion. For the end of September, Fujimi has announced a limited release of the Early Savanna GT with upgrade parts (Real Sports Car series, cat.nr.18896, price 2800 yen). 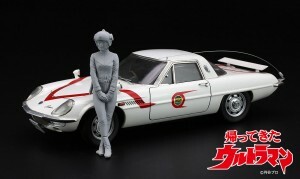 The Fujimi Savanna (Rx-3) GT early and late types are available now. Fujimi has scheduled another RX-8 kit for release by the end of august, it is the USA Custom version, which looks like a decal variant of the GTW-Wing kit (Inch-Up series nr.ID-BA, cat.nr.03644, price 2600 yen). 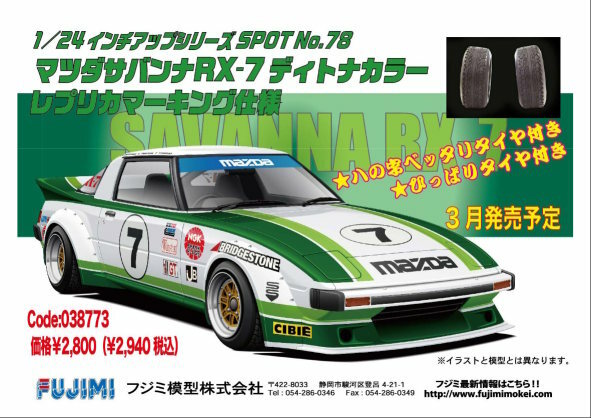 For september, Fujimi plans to release an Rx-3 Savanna GS-II (Nostalgic Racer series, cat.nr.04321, price 2500yen). For August Aoshima has a new RX-7 FD kit scheduled, this time a '98 facelifted version (Best Car GT series nr.58, cat.nr. 036327, price 1800 yen). Meanwhile the new Fujimi Rx-3 kits appear to have hit some delays. The long awaited Fujimi RX-8 Sports Prestige Ltd and the Fujimi RX-8 GT-W wing kits are available now from Hobby Link Japan and Rainbow 10. There's not much Mazda kit news, apart from a pair of Fujimi Rx-3 Savanna kits, an early and a late model, both will be from brand new patterns. The early one (cat nr. 03629, price 2500 yen) is scheduled for June, the late model version (cat nr. 03630, price 2500 yen) is scheduled for July. 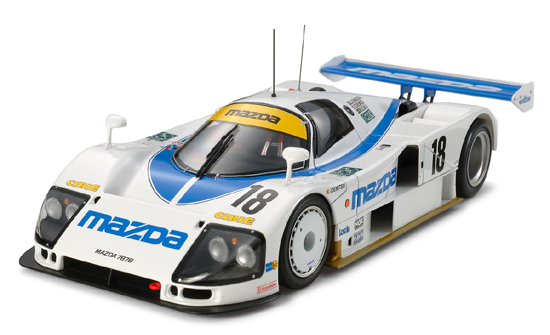 The Aoshima Rx-7 1979 Daytona racer is available now from Hobby Link Japan and Rainbow 10. The Fujimi Mazdaspeed RX-8 Sport Prestige Limited announced for last month got delayed, but it should show up this month. Meanwhile Fujimi issued a limited release of their Rx-7 SA fitted with Longchamp wheels (cat.nr. 03637, price 1800 yen). Note that unlike the picture on the announcement, the kit is for a street car and does not contain race decals. It is available now from Hobby Link Japan and Rainbow 10. 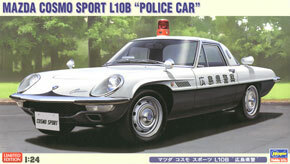 Also just released is the Fujimi RX-8 Patrol Car (Special Vehicles series nr.11, cat.nr. 18427, price 2700 yen), it is available now from Hobby Link Japan and Rainbow 10. Finally, scheduled for release later this month is another Fujimi RX-8, this time a Type-S GTW wing version (GTW Wing series nr.10, cat.nr. 18893, price 2600 yen). I borrowed the pictures from the Fujimi website. Next month Aoshima will do a release of the IMSA GTU class Rx-7 1979 Daytona racer, this kit will be based on the same reworked Imai kit with new decals for the red/orange/white nr. 77 car (Best vintage series nr.63, cat.nr. 03576, price 1500 yen). I borrowed the picture from the Aoshima's new releases web page. Fujimi plans to add another RX-8 to the Inch Up Disc series, this time a Sport Prestige Limited version (Inch Up series nr. ID-71, cat.nr. 03628, price 2600 yen). It is scheduled for release this month. I borrowed the picture from the Fujimi website. I almost missed this one: the Fujimi Mazdaspeed RX-8 Version II (Racing Star series nr.22, cat.nr. 03620, price 2600 yen) is available now from Hobby Link Japan and Rainbow 10. The Fujimi Mazdaspeed RX-8 A-Spec (Racing Star series nr.21, cat.nr. 18880, price 2600 yen) that was originally scheduled for November is available now from Hobby Link Japan and Rainbow 10. Aoshima just released two RX-7 FD kits that you definitely don't want to miss. First one is the revised Bomex RX-7 FD3S kit (S Package Version R series nr.80SP, cat.nr. 34583, price 2000 yen). This time there are true RE Amemiya style recessed headlights included and as an unexpected bonus there is also an optional set of lefthand drive interior parts. It is available now from Hobby Link Japan and Rainbow 10. 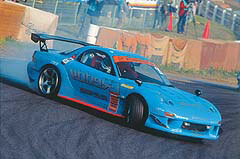 The second one is the Panspeed Asamoto RX-7 FD3S (D1 Grand Prix Series Nr. SP, cat.nr. 35139, price 2200 yen). This is a limited edition kit that comes with loads of spare parts. It is available now from Hobby Link Japan and Rainbow 10. Fujimi has released an Amemiya µ RX-8 (Racing Star series Nr.20, cat.nr. 18868, price 2600 yen), this kit was initially scheduled for release in June but has slipped down the list, probably because of the redesign of the basic RX-8 kit. It is available now from Hobby Link Japan and Rainbow 10. 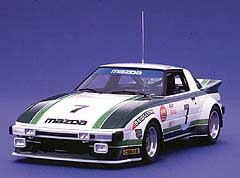 Aoshima has announced a kit of the 1979 Daytona class winning Rx-7 SA, this kit will be based on the Imai kit, but it looks like additional details and a brand new accurate decal sheet will be added. I borrowed the picture from the Aoshima's new releases web page. Also scheduled for this month is a rerelease of the Aoshima Bomex RX-7 FD, if I'm not mistaken it will include actual recessed headlights this time, instead of mock headlights on decals. In the meantime Aoshima also did a rebox of the popular RX-7 FD A'pex D1, this time as the first kit in a series dedicated to D1 Grand Prix models. The rereleased kit is no different from the first release. I for one hope that Aoshima will also release kits of the other RX-7 contenders in this exciting drift racing competition. Fujimi has released a VeilSide RX-8 Ver.1 model (Racing Star series Nr.3, cat.nr. 18866, price 2600 yen), this kit is available now from Hobby Link Japan and Rainbow 10. Fujimi also announced a Mazdaspeed RX-8 (Racing Star series, cat.nr. 18880, price 2600 yen) scheduled for release in november. 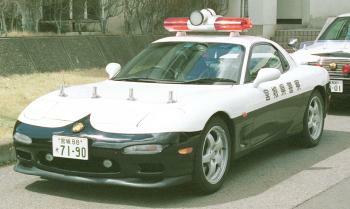 The Arii RX-7 FD Patrol Car (Owners Club series Nr.58, cat.nr. 47063, price 600 yen) is available now from Hobby Link Japan and Rainbow 10 . 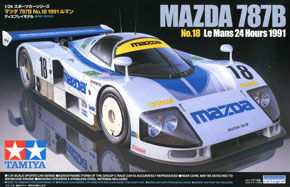 The rerelease of the Tamiya Mazda 787B (cat.nr. 24112, price 2400 yen) is available now from Hobby Link Japan and Rainbow 10 . At the recent Shizuoka Hobby Show, Arii showed a Highway Patrol version (Owners Club series Nr.58, price 600 yen, scheduled for release in June) of their excellent 1/32 RX-7 FD kits. Of particular interest is that the model at the show had Mazda stock 5-spoke alloy wheels and a stock front bumper, rather than the BBS style wheels and the custom front spoiler in the earlier Arii FD kits. Also on the show was a Bomex RX-7 FD, made by Aoshima, sold by AMT in the USA and imported back to Japan again by Platz, it is the same kit as described here in a different box. I borrowed both photo's from the 2004 Shizuoka Hobby Show report by Hobby Link Japan. The Aoshima RX-7 FD A'pex (S Package Version R series nr.84, price 2000 yen) is available now from Hobby Link Japan and Rainbow 10 . 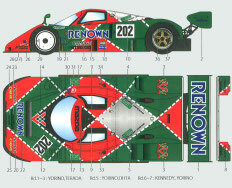 Tamiya is about to do another rerun of their Mazda 787B kit, this time the price went up to 2400 yen from 1600 yen last time, but Tamiya now includes decals printed by the famous Italian Cartograf decal printers. 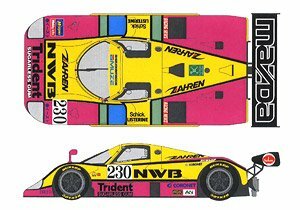 On top of that, Studio27 will do a rerelease of their Mazda 787B detail parts and three of their 787B decal sets (DC210C LM'91, DC216C Enfini JSPC'91 and DC228C Renown JSPC'91). This month Aoshima will add another RX-7 FD tuner special to its range, this time the D1-GP A'pex version, it looks like this kit will contain the same parts as the Vertex kit, apart from new wheels and a large decal sheet (cat.nr. 033784, S Package version R series nr.84, price 2000 yen, scheduled for the end of May). I borrowed the picture from Aoshima's new releases web page. Scale Auto Style will release a trans kit for an Re Amemiya FD3S RX7 2001 Widebody in the near future. If you're not familiar with Scale Auto Style, a trans kit consists of a set of high quality resin parts. You will need to do some cutting to the body to replace the existing parts of the body with the new ones in the kit. Fujimi has announced three new versions of their RX-8 kit, first there will be a limited release representing the Hydrogen Powered RX-8 Mazda presented at last years Tokyo Motor Show (Inch Up series nr.ID-AQ, cat.nr. 03598, price 2500 yen). Further more two tuner versions of the RX-8 are announced in the Racing Star Series, one by RE Amemiya (cat.nr. 18868, price 2600 yen, scheduled for June) and the other by VeilSide (cat.nr. 18866, price 2600 yen, scheduled for July). The Aoshima RX-7 FD Vertex (S Package Version R series nr.83, price 2100 yen) is available now from Hobby Link Japan and Rainbow 10 . 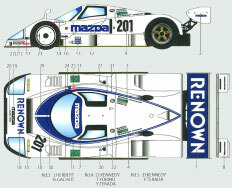 In March Studio27 will release a pair of resin 1/24 scale Mazda 757 kits and two sets of decals. One kit will depict a 1986 Le Mans 24hr race entry, the other one a 1987 Le Mans 24hr race car, more details at the Studio27 site. The Fujimi RX-7 FD Patrol Car (Patrol Car series nr.10, price 2300 yen) is available now from Hobby Link Japan and Rainbow 10 . 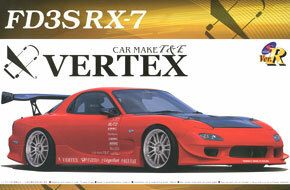 Aoshima will release an RX-7 FD Vertex in its 'S Package version R' series. The kit will feature Advan RG wheels and an A'Pex 3DG Extreme wing. (cat.nr. 033333, S Package version R series nr.83, price 2100 yen, scheduled for mid-March). 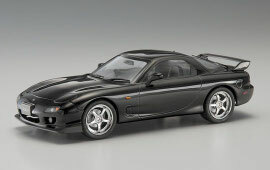 Fujimi will add an RX-7 FD to the Patrol Car series (Patrol Car series nr.10, price 2300 yen) by the end of February. Thanks to Hans van Rijssel for this picture of a full size RX-7 FD in Japanese Highway Patrol livery (note that the RX-7 on the picture is an early FD model fitted with the latest 17in RS type wheels). Fujimi recently did a rerelease of their much sought after RX-7 race car. It comes with decals representing the car that competed in the Japanese Sportscar Championship (cat.nr. 06232, price 1800 yen). It is available now from Hobby Link Japan and Rainbow 10 . The Fujimi RX-7 FD3S Mazdaspeed A-Spec 'GT-W Wing' (cat.nr. 18840, GT-W Wing series Nr. 3, price 2300 yen) is available now from Hobby Link Japan and Rainbow 10 . The Fujimi RX-7 FD3S 'USA Custom' (cat.nr. 03563, Inch Up Disk series Nr. ID-U, price 2300 yen) is available now from Hobby Link Japan and Rainbow 10 . The Fujimi RX-8 (cat.nr. 03552, price 2500 yen) is available now from Hobby Link Japan and Rainbow 10 . Another RX-7 FD3S kit is announced to be released in September (cat.nr. 18840, GT Wing series Nr.3, 2300 yen), the second Fujimi RX-8 kit is scheduled for December (RX-8 Type S Aero, cat.nr. 03564, Inch Up series, 2600 yen). Yet another RX-7 FD3S kit will be released in August ('Mazda FD3S RX-7 USA Custom', cat.nr. 03563, Inch Up series Nr. ID-U, 2300 yen). and dusted off their old SA22 molds to add a 1st gen Rx-7 to the Tohge series (cat.nr. 04555, price 1500 yen) which is available now from Hobby Link Japan and Rainbow 10 . 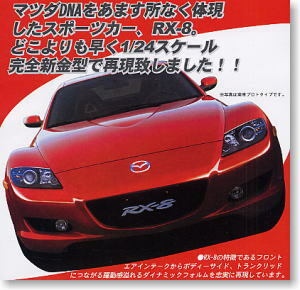 Hottest news is the announcement of a Fujimi Mazda RX-8 kit, scheduled for release in July 2003 (Inch Up Series Nr. 105, price 2500 yen). Aoshima has a Bomex RX-7 FD3S kit scheduled for June (S-Package Ver.R series nr.80, 2000 yen). I borrowed the picture from the Aoshima website. I almost missed this one the 'Advan GAB Rigid FD3S RX-7', yet another Fujimi FD3S kit with a fancy decal set (cat.nr. 18786, Auto Gallery series, price 2400 yen). It is available now from Hobby Link Japan and Rainbow 10 . More FD3S RX-7 kits to come are the 'FD3S RX-7 Spirit R Final Version' (cat.nr. 18796, price 2000 yen) and another Auto Gallery version, the 'Rudora FD3S RX-7' (cat.nr. 18791, price 2400 yen). The Fujimi Garage TT FD3S RX-7 (cat.nr. 18775, price 2400 yen) is available now from Hobby Link Japan and Rainbow 10 . Now that the final RX-7 rolled of the production line, a lot of new books, magazines and even some DVD's have been released, all dedicated to the RX-7. You can find some at HLJ and some more at Amazon Japan. In both cases do a search on 'RX-7'. 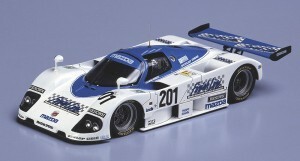 Fujimi will release a 'Garage TT FD3S RX-7' in their Auto Gallery series (nr. 34, cat.nr. 18775, 2400yen) scheduled for mid-October. In November, Aoshima plans to release a 'Dominique RX-7' (cat.nr. 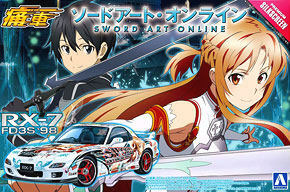 31346, 2300yen) in a new series called Wild Speed, now doesn't that sound a bit Fast and Furious to you ? The RE Amemiya The Street µ Greddy 9 (cat.nr. 18704, price 2600 yen) is available now from Hobby Link Japan and Rainbow 10 . 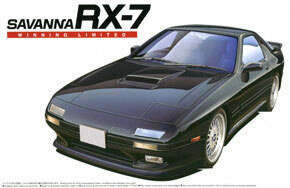 A while ago Fujimi announced a pair of RE Amemiya RX-7 FD kits, only to cancel them a little later on. Well, there's good news: Fujimi just announced a new entry in their Racing Star series: an RE Amemiya RX-7 Greddy 9 (cat.nr. 18704, price 2600 yen) to be released in August. I haven't seen any pictures of the kit or the exact version yet, but 'plain' is not in the dictionary of Amemiya-san so you can be sure it will be another great FD kit. 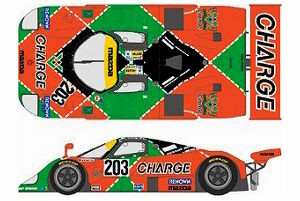 The Japanese company Museum Collection has released sets of High Tech decals for the Charge/Renown sponsored Mazda 767B and 787B race cars. The new Fujimi RX-7 FD Kai kit just hit the shops. 'Kai' stands for 'improved version', i.e. an upgraded 1991 or 1993 model. The kit includes a separate hood with a large vent molded on and separate bumpers. (Initial D series nr.17, cat.nr. 18352, price 2000 yen). The kit is available now from Hobby Link Japan and Rainbow 10 . In the meantime Mazda announced the final production version of the FD, called the Spirit-R an edition limited to 1500 cars which are rolling off the production line right now. Fujimi faithfully follows with a model kit of the Spirit-R Type A (cat.nr. 03537 price 2000yen) which is already available from Hobby Link Japan and Rainbow 10 . One more Fujimi FD kit is scheduled for release in July: a Mazdaspeed FD3S R spec (Racing Star series, cat.nr. 18715, price 2200yen). In any case the model is/was reported by several Tamiya distributors around the world. Good news from Tamiya is that there is a third spot production run of the classic Rx-7 FB kit scheduled for this quarter (cat.nr. 24016, price 1400yen). Fujimi has announced what will probably be the final version of their RX-7 FD3S kit, this time in the popular Tohge series (nr.30, cat.nr. 04046, price 1500yen). The kit is available now from Hobby Link Japan and Rainbow 10 . 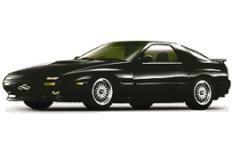 Tamiya have finally decided to update their RX-7 FD kit and have announced a Mazda RX-7 2000 (cat.nr. 24249). Tamiya lists new wheels, a new rear spoiler and a new front bumper as the modifications. Let's hope the kit includes an updated interior and engine details, otherwise it will be no match for the excellent Fujimi kits. Both Aoshima and Fujimi have announced another new RX-7 kit. The Aoshima kit will be an RX-7 FD3S VeilSide Combat II model, to be released in October (S-Package Version-R series nr.72, cat.nr. 29022, price 2000 Yen, see Aoshima's Fall 2001 releases). This is great news for those who want to model the RX-7 that stars in the movie The Fast and the Furious because that car was basically a VeilSide Combat II model. Main differences are the wild paint scheme, the recessed RE Amemiya headlights and the VeilSide Andrew Racing efF wheels, none of which are included in the upcoming kit. 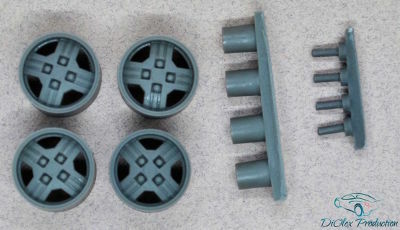 However the wheels are available separately from Fujimi (Parts Maker Wheel series nr.2, cat.nr. 19210) and the recessed headlights from Little Garage (cat.nr. CSP-07). The Fujimi kit is the latest 2001 Type R Bathurst R special edition, that recently hit the Mazda showrooms in Japan. 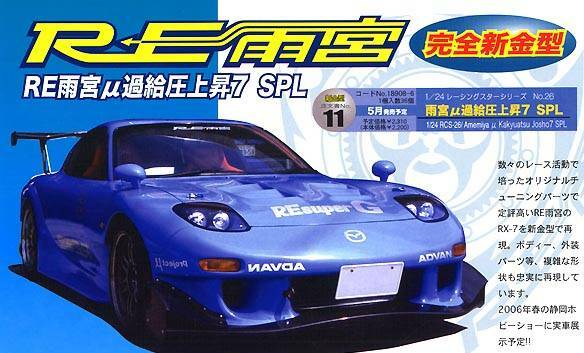 Once again Fujimi has the scoop on the latest RX-7 version ! The kit is available now from Hobby Link Japan and Rainbow 10 (Inch-Up series nr. ID-SP0, cat.nr. 03533, price 1600 Yen) It looks like a limited edition, so don't wait too long if you want one. 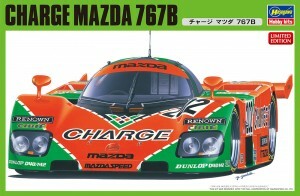 Hasegawa has announced a rerelease of the Charge 767B kit for November 2001. As with the previous rereleases in this series, the price is up slightly to 1500 yen, still a good price for a great little kit. The VeilSide RX-7 FD3S kit is released with the body parts molded in a color-shifting pearlescent plastic. (cat.nr. 028353, price 2400 Yen). In the S-Package Ver.R series, Aoshima released a street version of the C-WEST RX-7 FD. 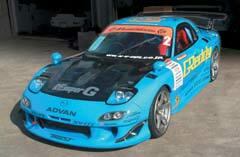 C-WEST FD3S RX-7 were entered in the Japanese Group.N Super Touring Car endurance races. The kit is available now from Hobby Link Japan and Rainbow 10. (S-package Version R series nr.70, cat.nr. 028339, price 1800 Yen). 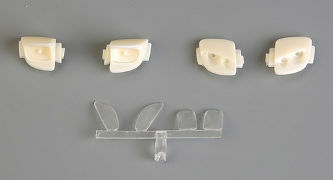 Fujimi recently released a separate Ae & Be Wing set (Grade Up Series, cat.nr. 11080) containing a pair of rear wings, the Ae wing can be fitted to several types of cars (no RX-7 is listed), the Be wing is a high rise wing designed specifically for FC3S kits. The Be wing can also be found in Fujimi's Just Tuning and 18in Low Profile FC3S kits. Another brand new release is the RX-7 FD3S Mazdaspeed A-Spec kit with carbon fibre bonnet (Carbon Aero Series nr.2, cat.nr. 18432). It is available now from Hobby Link Japan and Rainbow 10. 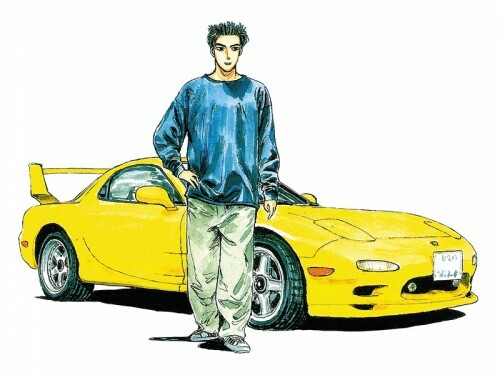 Finally for April there is another version scheduled of the 1/24 Ryousuke Takahashi RX-7 FC3S 'Initial D' kit, the price will be 3000yen and this time a resin figure of Ryousuke Takahashi will be included. 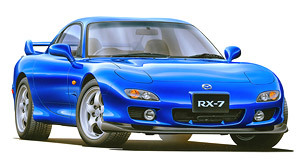 It looks like Fujimi's announced Amamiya RE Super-G kits were cancelled, but Fujimi did surprise us with a model of Mazda's latest and greatest 2001 model RX-7 Type RZ, available now from Hobby Link Japan and Rainbow 10. Aoshima has released both the FD3S Mazdaspeed GT-Concept and the FD3S VeilSide Combat Model 1 with factory painted bodies. 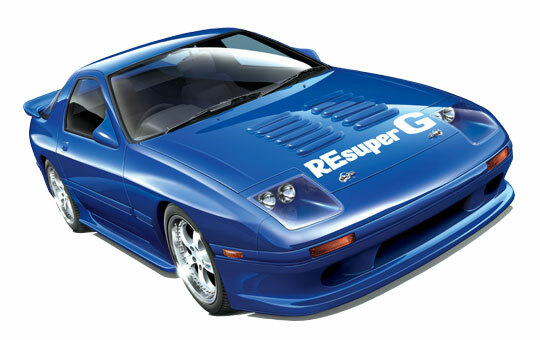 Tamiya has re-issued the FB Rx-7 Sun Roof SE Limited kit again. It is available now from Hobby Link Japan and Rainbow 10. Fujimi recently released their new Parts Maker Wheel series, with wheels custom made for the various car tuners. 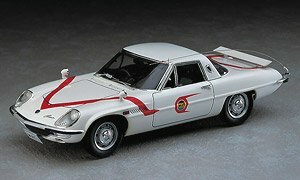 Fujimi has decided to honor one of the greatest Japanese Rotary Wizards, RE Amemiya, by releasing a pair of models of his awesome FD3S based creations. 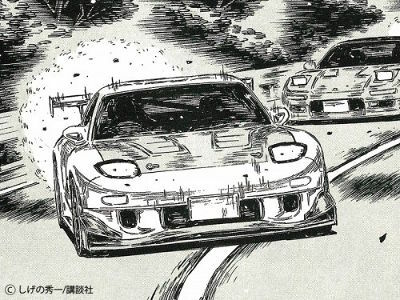 I borrowed the picture from the announcement on the Fujimi web site, where you'll find two new RX-7 FD3S kits announced: a street version and the race car on this picture, both based on RE Amemiya's awesome 'RE Super G'.